Here's Croatia Online's editor and co-author of the Croatia Cruising Companion keeping a close eye on the Marina Facility Solutions stand at the Zagreb Boat Show. The show finished on Sunday and the contents of the stand were dismantled, loaded up and driven back to Kaštela on Monday, so it's back to the day job today. You can read more about the show on http://www.croatiacruisingcompanion.blogspot.com/ but we found it to be a refreshing change from Split's April show - shorter, more "functional", indoors but very airy, and a much greater variety of exhibits which, in turn, attracted a wider audience. The organisation was also great with setting up and dismantling going like clockwork though I guess it helps that this is a purpose built exhibition space rather than Split's harbour and Riva area. According to today's press release from the show, both visitors and exhibitors were 10% up on last year - a total of 33,000 and 512 respectively. Also up 10% was the exhibition space - 27,000 square metres in 10 pavilions. From our point of view, some good new contacts were made, some firm enquiries registered, 24 books sold, and 42 copies of Time Out's Visitors' Guide to Croatia were snapped up. January 21st 2008 marked Croatia Online's second birthday. It looks like tomorrow, Valentine's Day, will give us our 30,000th hit. Statistic lovers also note that we have 190 earlier posts for you to browse through to give you a taste of the real Croatia (or go to our postings index - top right of the home page - to go straight to the topic you're interested in). In Croatia Online's short life we've covered a huge range of subjects and continue to try to bring the latest inside news on what makes Croatia tick - there's plenty more to come as Croatia continues to accelerate the pace of change and progress. Go back to our First Birthday Celebrations, for a review of our first year and to 20,000 Hits Celebration to see how we marked that. 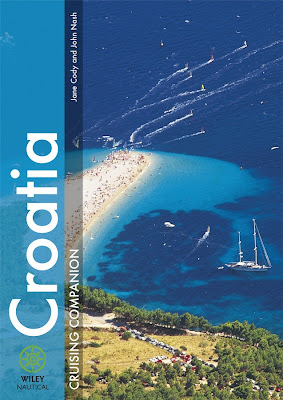 The highlights of the last 10,000 hits have been many, though perhaps the biggest one for us was the publication of our book - Croatia Cruising Companion - and the set up of a second blog to accompany it - http://www.croatiacruisingcompanion.blogspot.com/. The Croatia Cruising Companion was the end product of three years hard work exploring the Dalmatian Coast and Islands, from Zadar to Molunat. In researching the hard facts and writing the book, we've attempted to allow sailors (and land based tourists) to share our inside knowledge. It wasn't an easy project, demanding meticulous attention to detail, as well as endeavouring to convey the real "spirit" of one of the most spectacular cruising grounds in the world. But, finally, it all seems to have been worthwhile and, for a brief period in January 2008, it was Amazon's bestseller in the travel and holiday section for Croatia. It also "sold out" temporarily at the Excel London Boat Show. More intrinsically rewarding is the lovely feedback from a number of people who have bought the book. Of course we also have a lot to thank our publishers, for - they've done us proud on the quality finish of the end product and its distribution. It's widely available in the UK and internet sites such as Amazon, Waterstones and Tesco, and it's well stocked at the best international city centre bookstores in Croatia - Profil and Algoritam. So, apologies for blowing our own trumpet a little, but the Croatia Cruising Companion has been a huge part of our life here in Croatia and the final publication of it was a little like giving birth! However, like all proud parents, we've realised that we can be a little boring on the subject so this site will now confine itself to the essentials. A couple of backward steps for travellers to Split with British Airways and Wizzair withdrawing from the route completely. Fortunately Easyjet have extended their service to include a Bristol to Split route alongside their London to Split schedule. After a close battle with no overall majority winner, Ivo Sanader eventually managed to form a coalition government and continues as prime minister. Vis, Klis, Krka, Krapanj, Zadar, Šibenik and Split were just some of the destinations we reported on. Browse the postings for news on Split's new vegetarian restaurant, a Chinese restaurant just outside Trogir and Bibich winery near Šibenik. Check out http://croatiaonline.blogspot.com/2007/04/croatia-online-hotels-in-split.html for a review of hotels in Split (already due for an update!) and see http://croatiaonline.blogspot.com/2007/10/croatia-online-hotel-spongiola-on.html for a great hotel on a small island near Šibenik. 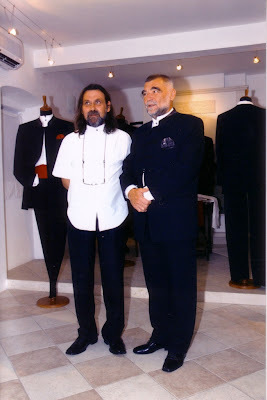 Today's photo is of the self styled "fashion artist" Gena, who makes classic quality suits, with one of his many celebrity clients, President Mesić. We interviewed Gena for this year's Time Out Magazine For Visitors' to Croatia (www.timeout.com/croatia), on sale in late April 2008 and he has a fascinating story to tell. We've also written features on tennis, Klapa singing and Wellness - you'll need to buy the magazine for the full stories but we'll be giving you a sneak preview in a few weeks time along with plenty of other news and views. Many thanks to all our visitors for their feedback and encouragement - please keep reading and sending in your comments. Just a few pictures from Kaštela's Masquerade. After a wet thundery morning the skies cleared for a dry parade that started around 3.30pm and must have been attended by a big part of the population of Kaštels Štafilić, Novi and Stari. As a postcript to our previous posting on business, we came across a useful website that gives sound advice on customs and etiquette in Croatia. It gives some great insight into the Croatian culture and how you can fit in with it and, for example, suggests taking flowers to the hostess if you are invited to dinner. Not chrysanthemums though as these are connected with funerals - hence the picture! Link to http://www.kwintessential.co.uk/resources/global-etiquette/croatia.html for the full text.